Sure, the App Store has a lot of games already, but Apple is hoping that a mix of new, exclusive games and well-curated titles, all playable for a catch-all subscription fee, will make Apple Arcade a hub worth visiting over competing platforms – or even consoles. Given the prominence of iPhone and iPad devices – over one billion in active use worldwide – many mobile or tablet games will naturally launch on the App Store first, with a possible port to Android later on in the title’s lifespan. There is a huge user base waiting to be leveraged, and who won’t need much convincing if the devices they already own are able to offer an expansive, rich variety of games. And gamers are realizing that portable devices can offer equivalent experiences as stay-at-home console – if the success of the Nintendo Switch is anything to go by. We live in a world where you can play Fortnite or PUBG online through your smartphone, carry Zelda: Breath of the Wild on their commute, and soon you may be able to stream Assassin’s Creed Odyssey to a desktop browser – while there are also countless indie games out there that tell rich stories without needing a vastly powerful on-board processor. Apple is also quick to specify that there will be “no ads, ad tracking or additional purchases” – which will help distinguish it from the exploitative end of free-to-play games often found on mobile. Apple Arcade will feature 100+ games at launch, with a mix of existing and new, exclusive titles. The line-up will be limited by the capabilities of the device playing it, but the performance specs of today’s flagship iPhones and iPads may not limit it much. We only have a few titles confirmed for Apple Arcade so far – Sonic Racing and Sayonara Wild Hearts among them – with no details on pricing. But a likely £9.99 / $9.99 monthly subscription would still look highly competitive against the cost of a Switch or modern Xbox One / PS4 console. The part Apple isn't drawing attention to? How much the Apple TV platform has struggled to attract gamers in the past. In late 2018, the bestselling crafting and exploration game Minecraft – yes, the one with the blocks – was effectively pulled from Apple TV after it failed to attract users. Developer Mojang ended up ceasing software updates and ending cross-play, given how little return it received on maintaining the game on the Apple TV platform. Shortly after, Netflix released its interactive Black Mirror: Bandersnatch movie, which allowed viewers to choose the direction of the story at key points in the narrative. But Apple TV was unable to play the software (along with Google Chromecast and the Windows 10 Netflix app, to be fair), and has up to this point seemed unsuited to anything more interactive than straight video content. 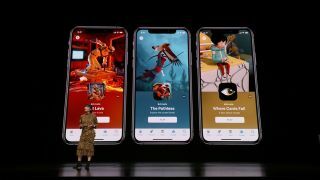 But creating a cross-platform service of the best iOS titles on offer, with the curation and subscription system to give it focus, and Apple could be making a lot of its users happier – without going head-to-head with the console makers already taking up space in the living room.